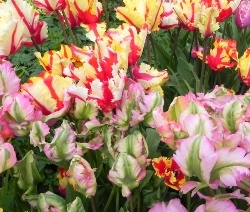 Parrot Tulips have single flowers with deeply frilled, ruffled, wavy petals. They are usually bi-colored with color accents on the flowers. Resembling tropical birds, they are the showiest and most flamboyant of the Tulips. Mid-Late May. 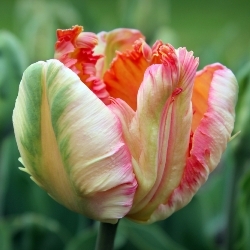 Apricot Parrot Tulips are soft apricot with tinges of creamy-white, yellow, salmon-pink and green. Fragrant. Gorgeous. 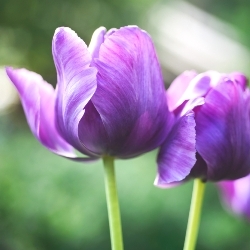 Blue Parrot Tulips are violet-blue, flushed bronze-purple inside. They are wavy-edged and fringed like feathers. 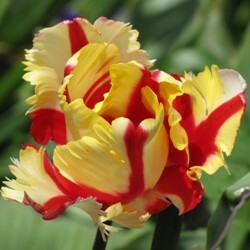 Flaming Parrot Tulips are bright yellow with deep crimson red stripes and strong stems. Also known as ‘Texas Flame’, they are widely used for cut flowers. Fragrant. 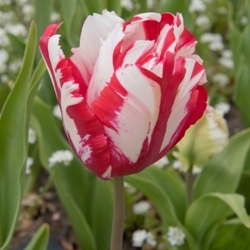 Rococo Parrot Tulips are fire red and heavily ruffled with carmine edges and sometimes hints of green and yellow. 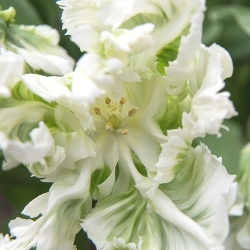 Not all parrot tulips are flashy – the White Parrot Tulip is more dignified, a gorgeous pure white full flower with slight green markings. Good for forcing. 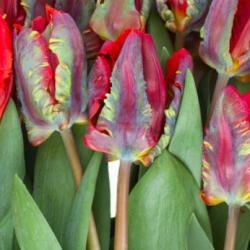 Mixed Parrot Tulips – a mixture of the above Parrot Tulips. A wild collection of color. Our Parrot Tulip Collection contains 20 each of Blue, Rococo and White Parrot Tulips, individually packaged and labeled.